In our weekly roundup column we look at what’s happening around the world that is of interest to miles and points collectors. Veiled in a cloak of positive changes, United announced more adjustments to its MileagePlus program effective Oct. 6. United’s announcement says that it is making it easier to book multi-city awards on its website, which it is. And, it also announced a redesign of its award ticket result display on the website, which it did. But, what sounds good on the surface is actually a negative change. It begins with the tightening of restrictions on making a stopover on award tickets like dictating that stopovers cannot be in the region of origin of your ticket. United is the only major U.S. carrier to still allow a stopover on award travel, but these changes limit your options. United is also raising fees for canceling or changing award tickets for almost all fliers. Elite 1K status holders and Global Services continue to get them free, but everyone else must now notify United of changes 60 days out or a penalty is imposed (even for Premier Platinum members who used to get free changes). United calls it a “streamlining” of the fee structure. General members will now have to fork over $125 to make changes within two months of travel. If you have Star Alliance Gold status and travel on Turkish Airlines, you have no doubt experienced one of the best airline lounges in the world. The airline’s flagship lounge at Istanbul airport stretches across two floors with numerous exhibition cooking stations, buffets with sweets and fruit galore, video game and golf simulation play areas, nap and shower rooms, and a roving team of masseurs. Following the failed coup attempt in Turkey, the airline, which is partly owned by the government, has made the awkward decision to rename the lounge to “July 15 Heroes of Democracy Lounge.” That’s just want you want to be reminded of when traveling: an attempt to overthrow the government where many were injured and killed. At least, you have the self-service bar to cheer up the mood. Odd. Change credit cards after booking? That’s right! In an unorthodox move, JetBlue is letting travelers with its co-branded Barclaycard credit cards change any reservation made with another card to their JetBlue-branded card without any penalty. Why is this newsworthy? The JetBlue card gives three points per dollar spent while the JetBlue Plus card offers six points per dollar spent. That’s a lot more points than you could earn with other cards, and if you just signed up, there is a bonus offer for spending on the card within the first 90 days. Spend $1,000 and earn 5,000 bonus points with the standard card and 30,000 points for the JetBlue Plus card. Simply call customer service with any upcoming reservation to have them refund your old card and charge the new JetBlue-branded card. 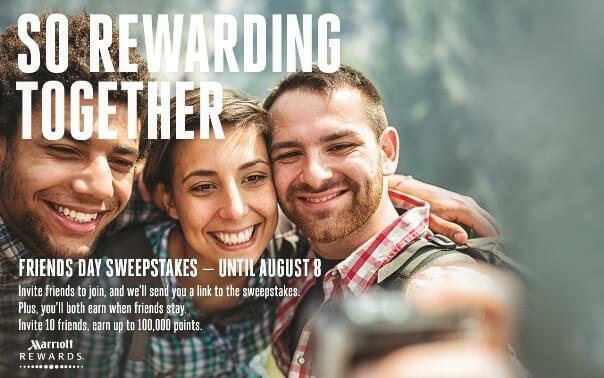 Invite up to 10 friends to join Marriott Rewards between now and Aug. 8. Each of you will earn bonus points when they join and make their first stay. Plus, you and your friends will be entered into a sweepstakes to win a $500 Marriott gift card. Each of you will earn 2,000 bonus points after each stay (up to five stays). Each season, FlyingBlue, the award program Air France and KLM among others, puts many of its flights around the world on sale if redeeming points. There are some exceptional values out there if you’re willing to make fall travel reservations by Aug. 31. For example, business class between Montreal or Edmonton and Europe on KLM is 25% off while economy class between Boston, Detroit, Houston or San Francisco is 25% off. Business class between Vancouver and Europe on Air France is 50% off. There are many other city pairs for travel including between Europe and the Caribbean or Europe and Asia. Don’t forget that FlyingBlue is a transfer partner with American Express if you don’t have FlyingBlue miles yet. It might be wise to open a free account now just in case you see a redemption in the future that appeals to you. Check your wallet for the American Express Hilton HHonors or American Hilton HHonors Surpass credit card. Make two stays between now and Oct. 31 to earn 5,000 bonus points when paying with your eligible card. Be sure to register first. Starwood Preferred Guest is known for its generous offer to turn 20,000 points into 25,000 airline miles, but currently they have an even more exciting offer. If you transfer 20,000 Starwood points to American, you can actually get even more bonus miles (10,000 to be exact). This offer nets 30,000 miles from 20,000 Starwood points. It depends what you value more, hotel points or airline miles, but this is a great deal for many. It lasts until Sept. 14. Make a reservation between now and Aug. 18 using code 2XMILES and receive twice as many miles in your Frontier Rewards account. Travel must be completed by the end of September to be eligible for double miles.